Two very busy days of hard work. Yesterday was a solid slog on the Power of Nature spiral . Some achievement amidst some set backs and assistant problems. I thought we might get it done today…but there have been some set backs. I have been reveling in the whole clay sculpting process.It has been a real pleasure to work with clay again.. been a while. 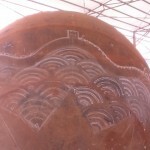 The clay is delivered to the sculpture in a wheel barrow then dumped on the ground. We just grab handfuls of it and mush it on to the steel and wire armature. It took a moment to drop my instinctual concerns about the air bubbles one would have if the piece was to be fired….but this creation will be destroyed in a few days .Once the plaster mold has been taken everything will be ripped apart . There is a real joy to continually feeling , scrapping, adding and taking away the clay from a sculpture. Your eyes have to be at one with your mind and your hands at the same time to make the form come to life as you want it to. My assistant …all cool and casual 22 years of him hasn’t got it yet.The 5 minutes on and 10 minutes off approach he has was getting really distracting yesterday. His attempts to perfect the shape mathematically that will never be perfect bothered me to the point of parking him for while ,whilst I pushed on alone. Well not quite alone , my trusty and very sweet translator ,Sunshine,stuck by me fanning me for while ( with her new plastic poki man fan we bought in a junk shop yesterday!) to ease the incessant heat, running to get bottled water and saying “Aragorn, don you wan to take a rest now”. The very natural , humble but confident hospitality of the majority of the youth crew,assistants and translators is amazing and a real benefit to all the sculptors. Who wouldn’t work to their best with 3 square meals a day, 5 star (well ,not quite) accommodation,all expenses paid and sweet Chinese girls fanning you whilst you work. !!. The metal work shop is another world entirely . The long awaited 3 meter ball arrived yesterday . It was a great moment to see it hoisted off the truck. The natural attraction of a perfect sphere had the sculptors stopping their work to watch. The workers….truly bee like,swarmed around it to control it’s swing on the command of their leader . I couldn’t do anything on it yesterday, but the kind Mr Wong,who looks over all things metal,arranged for the ball to be dismounted from it’s rack and to be centre marked vertically and horizontally . It is one of those strange things about creating chaos ,it is essential to start from order. This morning, after resigning to the fact that I would have to leave my spiral in the not so trustworthy hands of my assistant ,I began to make my first marks on the ball. I had gone to sleep last night by putting my brain on scan to find the answer to my ball design. It is the biggest one I have ever made , it would be good if it was the best , it has to talk to a lot of people, it will be seen by thousands….may be even millions over time. The design I submitted to the committee before coming here has lost it’s charm to me since experiencing this new environment. True to form ,a good nights sleep delivered me that unexplainable and overpowering human phenomenon… .inspiration.No jogging this morning , I literally woke up and found my self at my desk drawing my thoughts, throwing down ideas and playing up new ones. 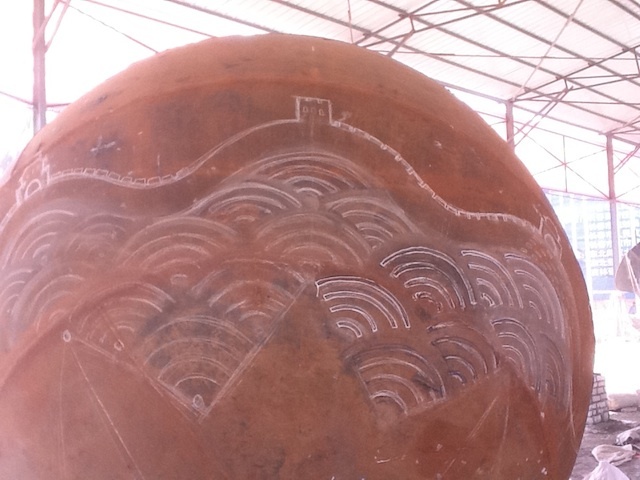 I had been looking for a pattern to ring the base of the ball and offer a frame to contain the chaos of the people….my searches online and in the little book I have on Chinese art gave me nothing, but this morning it was clear. What better border than the rolling castellation of the Great Wall it’s self ! Potentially corny , I know , but actually it works very well on lots of fronts . Quartering the ball, led me to eighth it ,perfect for the flowing dragon like wall to roll over 8 lucky mountains. Beneath that a fan pattern of 4 quarter circles fits well, layered like scales or plowed fields . I saw a similar pattern on a porcelain vase not long ago. It works to give me a landscape …and a sky to fill with souls. The top needed a similar boundary to hem in the mad throng ….a sun…no a sunflower, why not ? I was in a field of them the other morning in some ones abandoned lot garden. One of the great symbols for the Chinese people….or so Mao thought , if they would all bow to him – the sun, every day . Well this one is an all encompassing ,protective umbrella mystical sunflower, who’s seeds transform into people, who then multiply into a circular ,celebratory gathering that bursts out of the ball. Solution’s all round….plus a hole to pack it with wood when needs be. Any way that’s the plan….I am sorry I haven’t got a scanner on this I pad or I would scan the sketch !. In short I am committed and have started cutting….and so far I am confident it will all come together and work. The idea may be mad but the working conditions are really crazy. I am nearly asleep now , but I will muster my thoughts and give you some insights into the Chinese work ethics…..as seen from a first weeks perspective. Stay tuned.